Wireless microphone, also known as wireless microphone, consists of two parts, transmitter and receiver, usually called wireless microphone system. The transmitter is battery powered and the microphone transforms the sound into an audio electrical signal that, after being processed by internal circuitry, emits radio waves containing audio information into the surrounding space. The receiver is generally powered by the mains. The receiving antenna receives the radio waves from the transmitter. After being processed by the internal circuit, the receiver extracts the audio signal and sends it to the sound reinforcement system through the output signal line to complete the wireless transmission of the audio signal. A receiver usually can contain 1 set, 2 sets or 4 sets of receiving circuits, respectively, to receive 1, 2 or 4 wireless microphone signal, of which two are the most common. Such microphones may not have been heard after 90. It is the early people in order to get rid of some of the microphone cable fetters, learn from the principle of FM radio transmitting and receiving, through the microphone's conversion principle and audio → modulation → amplification → launch process, the use of FM radio receiver or dedicated receiver to receive sound. This method is simple circuit design, low cost, but poor quality, frequency instability, it is susceptible to interference from other radio waves, of course, the sound quality is not guaranteed. Now basically eliminated. After that, the wireless microphone using the oscillation frequency of quartz crystal appeared. Because quartz crystal oscillation frequency is relatively stable, so it consists of a wireless microphone transmitter and receiver, work will be stable a lot. This microphone has two low frequency and high frequency band. 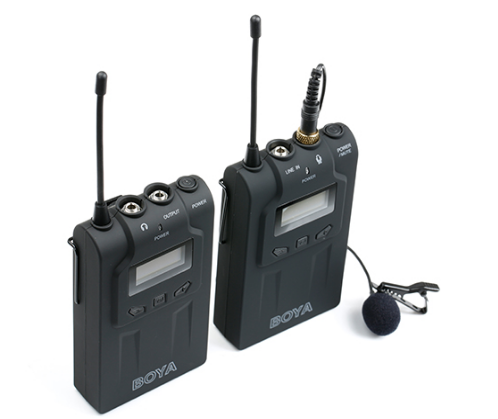 Although VHF microphones have made great progress compared to FM microphones, they still have the problems of narrow scalability, more frequent use of multiple microphones, less compatible frequency and small dynamic range of signals, and are susceptible to TV channels, welding, Motor and other clutter interference. Therefore, the emergence of UHF wireless microphone (referred to as U-segment microphone), the frequency of 300-3000MHz (generally used in the 400 ~ 830MHz band, more than 830MHz band less used, because more than 830 band frequency band diffraction ability gradually worse, susceptible to mobile phones Interference), the dynamic range of the signal, the wide range of scalability, multi-microphone can be used to form a larger system, but it can also better avoid clutter interference, the transmission of audio better and more stable.